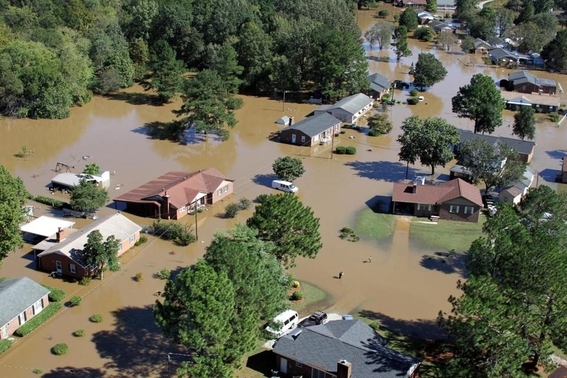 In the wake of Hurricane Matthew, floodwaters inundate houses in Rocky Mount, N.C.
HURRICANE MATTHEW's trail of devastation has been ghastly. In Haiti, the storm killed more than 1,000 people, and towns along the country's southern coast were smashed into rubble. Mercifully, the cost in American lives has been far lower; as of Tuesday, there were 33 confirmed deaths across Florida, Georgia, South Carolina, North Carolina, and Virginia. But the destruction in many areas has been appalling: shattered roofs, eroded beaches, washed-out roads, mangled piers. Downed power lines have set off transformer fires. Tens of thousands of homes and businesses have been blasted. Crops have been decimated. And the floodwaters are still rising. "Experts say Matthew could be the costliest storm to hit the United States since Superstorm Sandy in 2012, which had an estimated $68 billion in damages," reported ABC News on Monday. That sounds like an economic nightmare. But could it actually be an economic dream come true? Spoiler alert: No, it couldn't. The ruin and wreckage caused by hurricanes, tsunamis, and other catastrophes are grievous misfortunes that leave society poorer. What could be more obvious? Yet that never seems to stop analysts, journalists, and financial experts from insisting that widespread destruction is good for the economy. Just days after Sandy drowned much of the Northeast and reduced great swaths of the Jersey shore to debris, Bloomberg published a buoyant article on the economic stimulus that the cataclysmic storm was beginning to unleash. With vast sums of money being spent to fix damaged infrastructure, restore furniture and appliances, landscape ripped-up properties, and rebuild wiped-out homes and shops, it reported, "the storm is giving the US Northeast — and the rest of the country — an economic boost that may eventually surpass the loss of business it caused." Bloomberg's joyous headline: "Sandy Seen Boosting U.S. With as Much as $240 Billion Rebuilding." But had it not been for Mother Nature's wanton carnage, that $240 billion would have been spent on other goods and services and investments. The money could have been used to enlarge society's pool of material wealth and opportunity. Instead, those hundreds of billions had to be diverted to replace what the storm demolished. A lethal earthquake or tornado may create work for the workers and vendors hired to repair what was wrecked, just as it creates work for the undertakers and gravediggers hired to bury the dead. But on net, the affected community — indeed, the whole world — is left worse off, no matter how much is spent on cleanup and relief. Nevertheless, the notion that destructive calamities are a boon to growth never seems to go out of fashion. As Stanford University economist Russ Roberts wryly observes: "One of the most reliable results of any natural disaster is the spreading of bad economics." And here comes some more of it in the wake of Hurricane Matthew. "Hurricanes typically don't harm a nation's economic growth," USA Today reassured its readers as Matthew was starting its assault on Florida's Atlantic coast. "Most damaged homes, businesses, and infrastructure are repaired or rebuilt, generating economic activity." On Monday, the Tampa Bay Times was similarly upbeat, breezily noting that "any short-term hit on tourism and business interruption along Florida's northeastern coast could be offset by gains elsewhere, particularly as money pours in for reconstruction and beach renourishment." It's an appealing fallacy, and, apparently, an irresistible one: After devastating typhoons, forest fires, even world-shaking terrorist attacks, there are invariably those who insist that the devastation will make us wealthy. But post-disaster spending, no matter how bountiful, cannot undo reality. Real assets were destroyed, and destruction impoverishes. It leaves society with less. We can repair or rebuild what was destroyed, but society is still left poorer. For it has lost everything it would have otherwise acquired with the money that was used for relief. Wealth is not built through indiscriminate destruction, and hurricanes are never good news.